Monday will be with a friendly economy, Kwon Ai. Kwon, come on. Why would I want to do this now? Preventing voice phishing, exactly what is the detection application? Yes, it is one of the many measures that once seemed to be shrinking as voice phishing is soaring again. Let me first show you how it tells you what voice phishing is. Monday will be with a friendly economy, Kwon Ai. Kwon, come on. (Good morning.) I wonder why this is happening now. Preventing voice phishing, exactly what is the detection application? Yes, it is one of the many measures that once seemed to be shrinking as voice phishing is soaring again. Let me first show you how it tells you what voice phishing is. Advanced Criminal Investigation Division, Supreme Public Prosecutors Office. Banking Computer Security Team, Financial Supervisory Service. Seoul Metropolitan Police Agency. I heard a couple of real voice phishers' voices caught up in the authorities. My self introduction, this and that. Phishers who call phishers are slightly different styles. But there are patterns that usually follow. 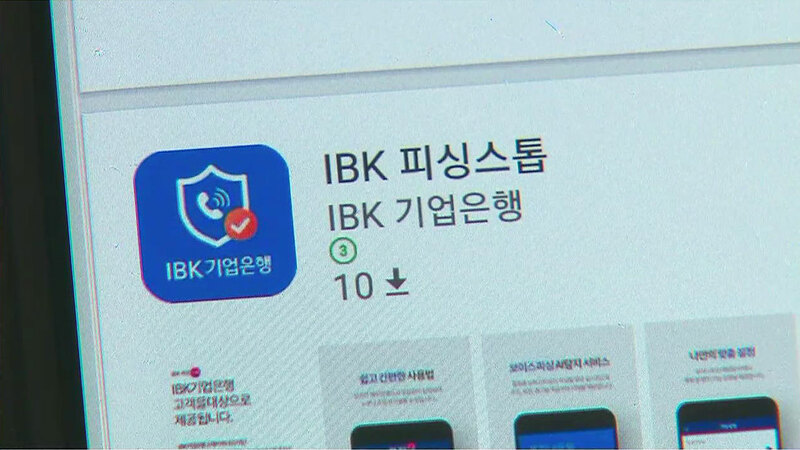 From today (18th), you can download an app called 'IBK Phishing Stop' from app marketplace. It is developed by financial authorities and banks. It is an artificial intelligence app that studied 8,200 actual voice phishing calls accumulated by the Financial Supervisory Service. This is a trial run, so if you have a bank account that participated in developing this app, you can use it for Android phone users. After a pilot run for two to three months, it will be open to all financial consumers. I have a phone that sounds like you just heard from me, but this app is laid out, and you will see a screen that you will see and a warning as the phone vibrates. Yes, if you are on the phone and that happens, you have to think, "This is voice phishing." If you do not know the phone, you can see that the screen and alarm you just showed are almost certain. The screen you just saw and the announcement voice come out when the app's artificial intelligence on the phone says "This phone is more than 80% likely to be a voice phishing phone." It's not as convincing as that. If you think that it is 60 ~ 80%, you will see another screen saying "Now is the stage of voice phishing" along with the screen you see now. I do not think it should be like this. Yes, and yes, what I showed you today was mainly calls to threaten you to be involved in a crime, but the fact is that there are a lot of people who are asking for a commission to get a loan rather than something like this. It's not really a pattern, so it's important to stay updated to keep getting more accurate, so we'll keep adding more phishing cases to keep our AIs from catching up with new types. In fact, I've interviewed a number of people who have been victims of voice phishing. I think there are more elders but it is not. According to the amount of damage last year, the middle-aged people in their 40s and 50s were the largest, and those in their 60s and 20s and 30s were similar in size. When you get a phone call, you say "I really thought I would not like this, but I'll give you money when I'm young." Of course, it is sad to doubt that the phone will be used as an app, but the fact that voice phishing was a little stagnant around 2015 ~ 2016, the financial authorities have publicized a lot of actual phishing voice voices. There is a side that has been sluggish because it is big. However, since it has been a while since I began to take advantage of it again, the amount of phishing damage last year was the largest ever. Even when compared with 2017, it doubled even more. Voice phishing "Now who will get it" I do not have this situation at all, I think these detection methods are new and it's ok to use them.